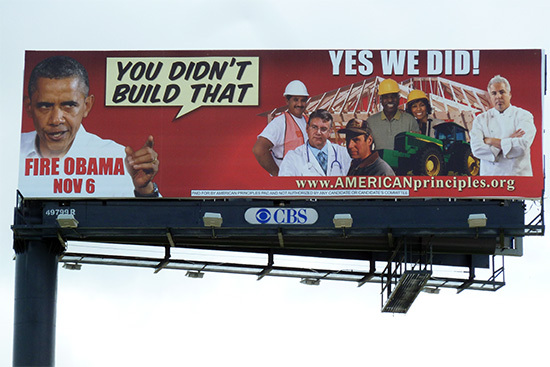 American Principles hammers Obama on “YOU DIDN’T BUILD THAT” with billboard on busy I-95 in South Florida. After our successful billboard program highlighting the perils of an unsustainable level of national debt, which is approaching $16 trillion for the U.S., AMERICANprinciples is “ready to roll” with our message on free enterprise and the role – or lack thereof – of government in individual achievement and success. 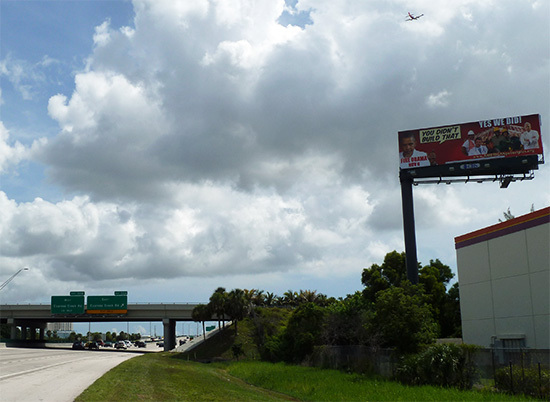 Our latest I-95 South Florida billboard, shown above, highlights the fallacy of President’s Obama’s message that success is the result of the efforts of others, not of the individual. Our Declaration of Independence was written, and our nation was founded, in part to empower the individual to maximize his or her potential and achievement. Government and communal intervention is not only counter to our basic founding principles, but an obstacle to American Exceptionalism and success. The gift that keeps on giving those famous words by Obama. He’s still getting hammered by it. Now local Orlando businesses are putting their names on the ad in defiance to a president that thinks they didn’t do it themselves. Bashing Obama for saying “you didn’t build that” along I-95. Which of course is a freeway built by the Federal Government! LOL! I95 built by the feds? the navy seabees or the army corp of engeneers? they are the only federal construction outfits i know of. being an out of touch conservitive and totally stupid i may be wrong, but i think ( do conservitives think?) that a privately owned company built that funded by TAX PAYER MONEY!!! wish i could LOL but i find no humor in leftist liberal cool aid. Obama already took $716 billion dollars away from Medicare which would help seniors now and made the coverage be as low as Medicaid. He put seniors under a board to decide if we get treatment. My knee doctor said that if Obamacare passed, we would never be able to get new replacement knees or hips because the younger 50-yr olds who needed them from playing sports would be first to get them. He said the number of doctors who are retiring would mean that there wouldn’t be enough doctors to perform the surgeries. Anthem Blue Cross/Blue Shield already sent a letter to a friend of mine showing the increase in premiums because of this Obamacare. They said that the largest increase came in 2014 because that was written into the Obamacare –that increases could not happen until AFTER the election. The premiums for seniors who were currently on Medicare would double in that year. In addition if Medicare isn’t reformed, it won’t last for most of the baby boomers to collect it for the rest of their lives. Obamacare offers health care to the 49 percent of the American public who already pay NO taxes. Did you realize that we are FAST becoming a welfare/socialist/communist state? This will not be sustainable because there will be no incentive for people to work or to work harder with all of the entitlements. We will all be SLAVES of the government. We will have lost our FREEDOM. The “Federal Government” never laid a foot of highway. A bunch of small business contractors did. #1) “you didn’t build that” was taken out of context, Listen to the speech. #2)You earn the right to become President by being elected by the majority of the vote by the American people, and you don’t earn the right to be President by being appointed by a right wing Supreme Court, or by cheating on the vote count, or by rigging the voting machines. #3)Taxpayer money goes to the Federal government, we the people are the government therefore the highway was built with federal money.Yes you are out of touch and a neocon or a tea party member there are no True CONSERVATIVES IN GOVERNMENT anymore. #4)Obama obtained the 716 billion by cutting programs that were not working and from subsidies paid by the insurance companies in exchange for a promise by the insurance people to stop paying the huge bonuses to their executives because they would benefit from the increase in business from all of the uninsured people when they got into the system. The 716 billion was then plowed back into Medicare to increase preventive care programs and lowering the price of drugs for the elderly. Obama wasn’t talking about Highways Iriemoron, he was talking about Privately ouned business! You do realize that the sentence before “you didn’t build that” was talking about the roads and infrastructure right? The point is that taxpayers pay for roads that business uses, schools that educate the employees, police and fire services that protect from fire and theft. I am a business owner and I know of no other business owner that built the roads that they use. Also the $716 Billion was a reduction in expected growth of medicare costs. Payment to providers is going down while benefits remain the same. It’s like when I find something cheaper from a particular supplier. It SAVES money. You’d have to be an idiot to prefer medicare costs to be higher for the same service. Learn to educate yourselves and stop falling for these ridiculous lies. They have already been proven false and they still will not stop repeating it. Also see any unedited video as we are on the internet. Sorry, but you have no principles. You just lie to people. I personally heard President Obama and the quote is shortened and taken out of context–he said you didn’t build the infrastructure not your business. I have found that whatever Republicans say the opposite is true–I am independent voter and thank God I can vote for either party because this year republicans have gone off the rails. If you do a Google search with “Who built I-95 in South Florida contracting company” you’ll find a website called Southeast Construction. Listed there are highway projects and private contracting companies that were hired to build them. In truth, the government didn’t build the roads. Taxpayers and private companies built the roads. The government simply made a decision to spend our money to pay for these projects. If you were to say that government built them rather than hired them done, then you are also saying that if you pay a plumber or an electrician or carpenter to work at your home, you actually did the work rather than them. Use common sense. That’s misplaced ownership of the professional work. That makes of no consequence anyone who has expertise and is hired do work the party with some cash can’t or won’t handle themselves. And with that standard of measure, the bigger the purse, the bigger the “contribution” and the more value assigned to the person with the money. That’s backwards. It’s just simply an un-American idea, illogical and a discounting of the intelligence, sweat and enterprise of hard-working Americans. And since the government doesn’t pay anyone with the money they earned, but rather with the money others earned and they demanded from them, it’s even more ridiculous and insulting. I poured Cat Litter into my Cats Litter Box…..
Then he Plowed the waste under the Sand…..
My Cat Built it. You Moron…….. I totally agree Betty, I just hope and pray that enough informed citizens realize what he ( the savior) is doing to America! You ARE very informed, thanks for the input. What an amatreur for sure! Check out a major search for: Free Enterprise: “We Did Build That” to find out where my wife and I stand on this subject. It has rocketed to the top of the major search engines…The bottom line: 36 years of building our own publishing business without government help! Those bridges and roads Obama refers to were paid by the taxpayers hard-earned money, right here in the USA! By the way, the governments in many communist countries and Nazi Germany also build roads and bridges? So, the president used a terrible analogy! It’s time to take back America with sensible solutions to problems and to the outrageous Obamaare tax, the largest in our country’s history! We owe it to our children to defend America against socialism and out-of-control spending! Stand up, Americans! Who out there is with me? democrats are Economic Morons. I have never known one capable of understanding basic Economics. liberals think they can do whatever they want and the consequences will be what they expect. Obviously they skipped History as well. They need to study and understand “The Law of Unintended Consequences”. I am 61 and for my entire life, the democrats have experimented on America, with horrible consequences. Teachers were forced to concentrate on the New Math, and students lost the ability to do Arithmetic. Thank you to each of you for the vigorous commentary and debate. We were determined to see 2016 the movie. It’s sort of unbelievable that hollywood.com did not show it even existed. Media bias at its most despicable. We did google where it was showing, and found only 4 theaters. We were surprised that almost every seat in the theater was filled as we learned what a mistake was made 4 years ago. Hopefully, we will learn from that mistake in November. If Obama gets re-elected, GOD help the people of the USA!!! Why is there so much hatred and anger among Republicans? You missed the whole message, which was that we are all in this together. Yes, people did build their businesses but there are aspects of it where help was received whether you admit it or not. Republicans just cannot get over how well liked President Obama is and they can’t move on that he won the election. Lordy, you are a sorry bunch. From 1979-2000, the Middle Class had wage average increases of 11.5 cents/hr/year. From 1989-2000, American CEOs had increases in salary, pension, stock options of 342%, this during the Reagan, Bush I and Bush II administrations. Currently, 26 CEOs in the US averaged more than $20 million/annually (total compensation). That’s a 23% increase over 2010. The wealthiest send their funds to the Caymans and Swiss accounts to avoid paying taxes. (Yes, Mr. Romney) Think what you could do with 25% of these gain and if you could pay only 13% in taxes versus the 28% the middle class is forced to pay. You might also be able to invest and grow wealth. All this through lobbyists who buy off legislators for the wealthiest in our country. Go ahead and research it. You will see that the Republican Party is not a friend of the middle class. Much of our debt went to funding two wars that were not Obama’s. Don’t take those sound bites without seeing how Politifact.com grades them. You vote is important. Make sure you know what you are voting for. After struggling in the restaurant/bar business for 18 years in Washington State, I have to say we DID BUILD IT despite over taxation and excessive state and county fees, along with the highest minimum wage in the nation. Not sure how much longer we can hold on, however, despite working many excessive hours as owners. If only state and federal government would reward and recognize those who hire or would like to hire the most people iin our country, namely small businesses. @Iriemon Who do you think the Federal government is? it is USA citizen that hire politicians to do the business of the country. WE BUILT the Interstate with our Tax Dollars. Bravo for this site, Having built businesses of my own, and spearheaded the recovery a few failing businesses. One constant remains, the freedom to make tough decisions that we ultimately reap the benefits, or the losses from, is the driving force that persons who’ve never had the courage to venture out on their own, have any right to have an opinion on. Obama is a Marxist in every way. He is a menace to America and needs to be removed from influence. If his supporters in this country really had any idea of what their personal lives will look like in a few short years. They would turn on him and insure his political exit. Visit http://www.WayWorseThanTed.com and help expose this communist young man who somehow sits in the white house. If he is re-elected. I will be shutting down all my operations. and leaving this Country. I refuse to live in a Nation where a Tyrant runs unchecked, and wants to give my lifelong, hard earned, and fiscally responsibly developed wealth, to persons to lazy to make an effort, or to the scumbags in the U.N that see it prudent to tax the U.S citizenry to pay for their Global plans . WAKE UP or be enslaved you pathetic drones. turn off your TV you dumb asses. Man, this dude is anti-American and his plan is to destroy the US economy, following the philosophy of Frances Fox Piven, another lunatic. He’s anti-American, socialistic, arrogant, hateful, racist, and totally inexperienced. Man, I dislike this doink. First off any roads that have been built, whether by the Army Corps. of Engineers or by private companies, was all financed by TAX PAYER DOLLARS!!! The government does not produce ANYTHING! All they are capable of is taking. Besides, it is part of their role to maintain and build our infrastructure, as well as MAINTAIN OUR MILITARY AND PROTECT OUR BORDERS!!! Currently they are not doing either very well. Without those people who have sacrificed while building THEIR BUSINESSES, government would not have the funds to do anything. And thanks to the rest of us taxpayers who work for the people who built their business, the government gets additional revenue through our taxes. For all of you who think it is the governments job to control every aspect of our lives, healthcare, what can or can not drink (NY bans super-sized soda), or whether or not we can say the Pledge of Allegiance in a classroom or pray in public should spend a little time studying history. Hitler, Mussolini, and even the Islamists all want to dictate to the people every aspect of their lives. Never worked. Never will!! Obama clearly did say “you didn’t build that” and if you didn’t hear it you have been drinking far too much of his kool-aid. Regarding Obamacare my Supplement insurance (I’m on Medicare) has DOUBLED in price and I already got notices that it will go up again this year and again in Jan 2013. Get this guy out of office before every senior is broke. For those drinking his kool-aid how is the interest on your savings coming?? What about paying him 43% of your dividends….didn’t you work hard to buy them. Enough Mitt Romney and Paul Ryan must win this election. Obama is killing seniors in more then one way. Unbelievable has it correct. Too bad our political leaders don’t understand it that well. They are “what is in it for me”. Fire Obama, hmm, so we can have war and more tax cuts for the rich, I don’t think so!